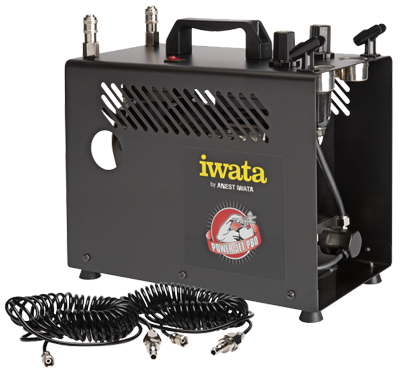 The Power Jet Pro compressor features a powerful twin-pump, 1/6 HP induction motor and is equipped with twice the features of the Power Jet Lite; such as two air pressure regulators for precise adjustment of airflow at two individual workstations for running two airbrushes independently. 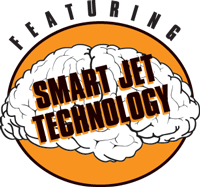 The Power Jet Pro is twice as powerful as the Sprint Jet compressor. Economically priced, the Power Jet Pro has a 2 litre tank reservoir, which increases moisture separation and smooth’s out the air flow. 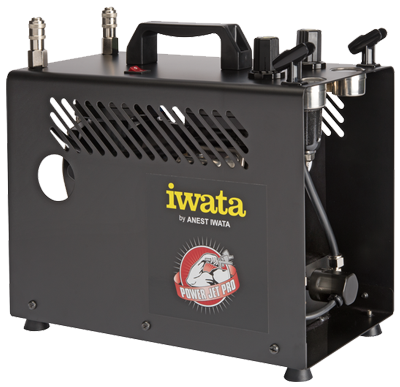 It delivers all the power necessary to run two fine airbrushes or one high-flow airbrush or a low-volume spray gun at low pressure. This type of machine is preferred when heavy use is expected or higher pressures required. 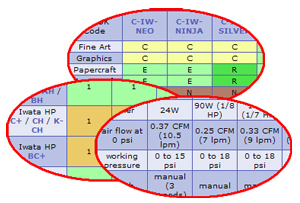 View our guide for the applications the Power Jet Pro is best suited for.